LG kicks off 2018 with new soundbars and smart speakers | What Hi-Fi? 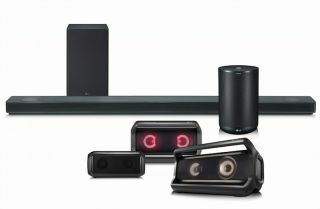 Ringing in the new year, LG has announced a new soundbar and an array of wireless speakers, all of which are set to appear at CES 2018. The SK10Y soundbar delivers 550W of power and has a 5.1.2 channel setup. Two of those channels are used by up-firing speakers to cater for Dolby Atmos sound. It's the first product to emerge from the new partnership between LG and Meridian Audio, which was announced in December. Meridian's Bass and Space technology is designed to immerse the listener from any seating position, while the company claims its Height Elevation tech can raise the sound up to the level of your screen. The SK10Y supports lossless music and can also upsample low-resolution audio files to 24bit/192kHz. Google's Chromecast tech is built-in, so should you have a suitable smart device like the Google Home (or the Mini, or the Max, or Sony's LF-S50G) - you can use voice control to get your tunes playing. On a smaller scale, LG is bringing out the PK series speaker (above, left), which plays music and sets the mood with lights set in the drivers. This speaker range also features input from Meridian Audio and is compatible with aptX HD Bluetooth for high-quality wireless audio. Finally, LG has also unveiled the ThinQ Speaker (above, right) - its first ever product with Google Assistant built-in. It's another audio product that's been given the Meridian treatment, while LG also claims that you'll be able to use the speaker to interact with other LG home appliances. We'll hopefully get a closer look at this line-up and more when CES 2018 kicks off on Monday 8th January.